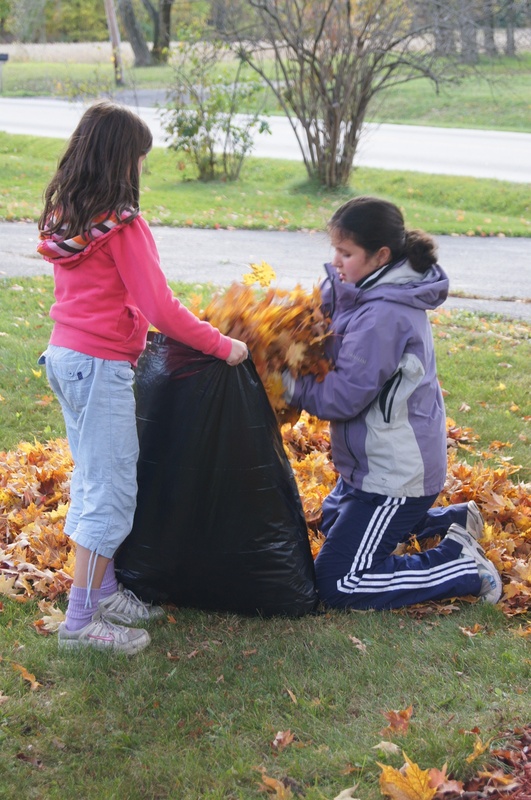 You're invited to our fall work day! Join us for a day of outdoor and indoor work projects, prayer, food and fun at the monastery on Saturday, September 28. Volunteers of all ages and abilities are welcome! The day begins at 10 a.m., includes lunch, and closes with vespers at 5 p.m. followed by a cookout. Come at whatever time you are available, and bring a side dish to share if you can. Please RSVP by Tuesday, September 24, to 440-834-0290 or christthebridegroom@gmail.com, so that the appropriate amount of food can be prepared. We're praying for all those who are travelling this weekend to Mt. St. Macrina in Uniontown, Pa., for the annual pilgrimage! "Since we are surrounded by so great a cloud of witnesses..."
We promised to post a longer article about our girls' camp, and although we are a bit behind, we still wanted to share with you about this fruitful weekend that took place here earlier this summer! This is the article that appeared in the most recent issue of our eparchial newspaper, Horizons. To view our photos, click here! “We are witnesses” was the theme for the fifth annual Life in Christ Girls’ Sleepover Weekend (“Girls’ Camp”) June 27-30, 2013. Fifteen teen girls from Ohio, West Virginia, Michigan and Wisconsin, along with seven young adult facilitators, camped out at Christ the Bridegroom Monastery in Burton, Ohio, for a weekend of prayer, talks, discussion and fun. The weekend began on Thursday evening with a documentary on the life of St. Maria Goretti, followed by discussion. The girls were surprised by the patience of St. Maria in her everyday life, her example of purity and her forgiveness of her murderer. On Friday morning, Sr. Cecilia and Sr. Gabriella, of Christ the Bridegroom Monastery, spoke about the call of each person to be a saint. A saint, they said, is someone who is holy, and “holy” means to be “set apart.” Therefore, holiness is not first a matter of “doing” but of “being”; it is a gift from God. They shared the ways in which we open ourselves to the gift of holiness: through prayer and the Holy Mysteries (Sacraments). The Sisters then talked about the examples the Church gives to us in the canonized saints. Young adult facilitator Stephanie Bullock spoke about the single life, particularly the temporary state of singleness as a special time of grace and growing in holiness while discerning one’s ultimate vocation. Young adult couple Art and Maggie Klatt spoke about the vocation to marriage and the challenges and joys of seeking holiness through setting aside self out of love for God, spouse and family. Mother Theodora, of Christ the Bridegroom Monastery, spoke about the vocation to the monastic life and shared her journey of discernment. The weekend culminated with a Hierarchical Divine Liturgy on Sunday morning at the Shrine of Our Lady of Mariapoch, across the street from the monastery. The girls and their families joined the Boys’ Camp participants and their families for this moving, youth-cantored liturgy with Bishop John, followed by lunch and an awards program. 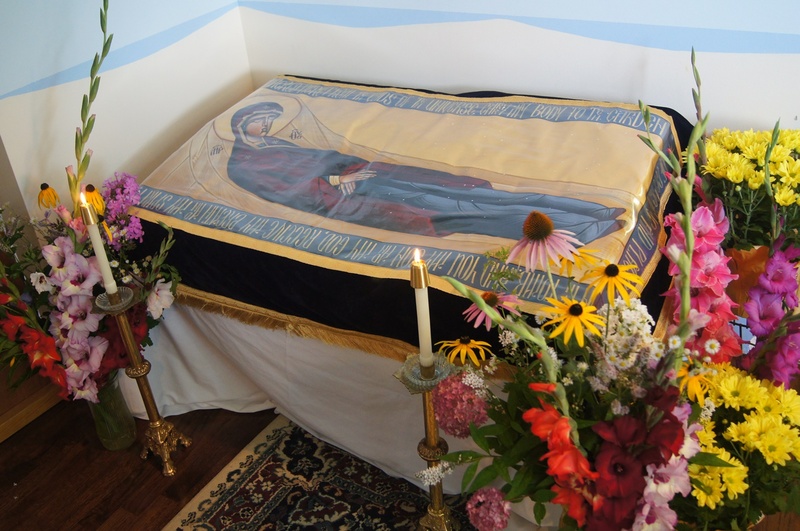 "FIAT: Mary, Our Model of Faith"
Happy Feast of the Dormition of the Mother of God! If you missed Deacon Sabatino's talk this past Sunday at the annual pilgrimage at the Shrine of Our Lady of Mariapoch (or if you just want to listen to it again, like we did! ), today is a great day to watch this video we filmed! Deacon Sabatino spoke on the theme for the pilgrimage, "FIAT: Mary, Our Model of Faith." What is faith? What does it mean to live by faith and not by sight? What is knowledge? Why are we so afraid to give our lives totally to God? How do we become fully alive and truly happy? This is a perfect talk to listen to on this feast of the Mother of God, during the Year of Faith! Deacon Sabatino Carnazzo is the founder and director of the Institute of Catholic Culture. Last night we enjoyed the beautiful vigil for the Feast of the Dormition, including the burial procession with the shroud of the Mother of God while chanting the Song of Songs! Our beautiful flowers at the tomb were also blessed today at the Divine Liturgy, as is tradition.